Members and guests of Onward Lodge No 5540 gathered at Fleetwood Masonic Hall to celebrate the installation of Barrie Whiteside into the chair of King Solomon for the first time. David Winder (left) congratulates Barrie Whiteside (centre) and Adam Simpson. Assistant Provincial Grand Master David Winder was the principal guest on this auspicious occasion. He was supported by Harry Cox, North Fylde Group Chairman Peter Greathead and supported by acting Provincial grand officers John Pitched, Mike Pinckard, Gary Norris, John Riley, John Anderson, Ben Gorry, Chris Tittley. 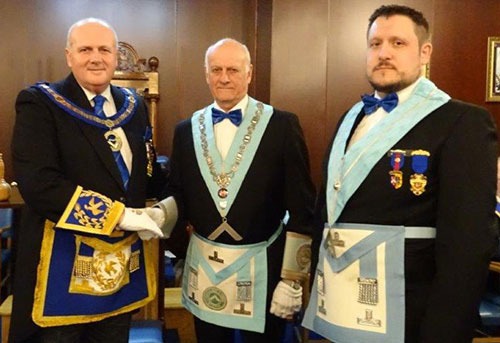 The WM, Adam Simpson, discharged the early business of the lodge with style and as one of his last duties in charge rose to thank all those who had taken office during his year. Adam then began the installation by inviting Russell Smith to act as installing senior warden, Ian Nicholson to act as installing junior warden and Paul Dunne to act as installing inner guard. This duty completed and on opening the lodge to the third degree, Mike Brown the lodge’s hard working director of ceremonies, this installation being his swansong and retiring after 11 years of service, entered to announce that David Winder was without and demanded admittance. The grand officers entered to what was a full room. Adam rose to welcome David formally and to offer him the gavel of the lodge, which David politely returned. Pictured from left to right, are the working tool stars: Kieron Griffiths, Jonathan Melvin, Tom Walderman with David Winder, Barrie Whiteside and Adam Simpson. Russell Smith presented Barrie for installation with the upmost sincerity. 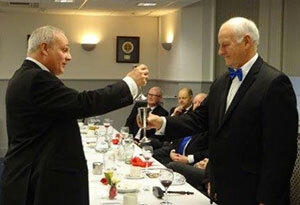 Barrie completed his obligation with skill, and thereafter Barrie was installed into the chair of Onward Lodge. The address to the master was done by Russell Smith. Barrie then installed his officers for the coming year. The warden’s address was given flawlessly by Alan Lock, while James Rashid skilfully addressed the deacons. John Pitches Provincial Grand Steward addressed the lodge’s stewards with warmth and sincerity. David Winder completed the proceedings with an address to the brethren of the lodge with true feeling. Ted Bottomley addresses the haggis watched keenly by the piper. On the completion of the installation, David brought the best wishes of the Provincial Grand Master Tony Harrison. He congratulated Barrie and his installing master Adam on a first class ceremony of installation. David then asked Barrie if he might go around the lodge and thank all those who took part in the ceremony which to much delight of the assembled brethren he did. Barrie then presented David with cheques for £1,000 to the Masonic Charitable Foundation 2021 Festival and £1,000 to the RNLI Fleetwood. He thanked the brethren for their donations to such worthy causes. The installation finished, the brethren assembled in the dining room while the new master Barrie and David were piped into the dining room for a Burns supper of Scotch broth, haggis, neeps and tatties, roast beef, cheese and biscuits as is tradition in Onward Lodge. 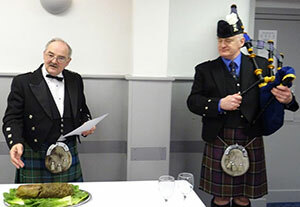 Once the broth was finished the room again was filled with the sound of bagpipes as the haggis was suitably piped into the dining room and addressed with all the passion that the night demanded by the lodge’s own Ted Bottomley. The meal finished and in response to the toast to his health, David rose and thanked everyone for making him so welcome, David commented on how well the lodge was doing with so many light blues. David proceeded to mention a few notable events that occurred in the same year that Onward was consecrated ‘Alcoholics Anonymous’ was founded, Elvis Presley was born and jockey shorts were invented. John Darrell (left) toasts the master during the master’s song. David moved on to congratulate Barrie on obtaining the chair saying that it is something the he will remember for all time and in serving every office on his way to the chair will stand him in good stead for the coming year. He continued on to thank Barrie’s immediate and installing master Adam who has been a shining example to all in his year having visited many lodges not only in the North Fylde but in other Provinces and representing Onward Lodge with dignity and pride. The brethren who presented the working tools were praised by David, saying that it was great to see an entered apprentice, fellow craft and master Mason presenting their respective tools. He also thanked all the acting officers who had come to support him and the lodge. David commented that it was great to see so many wearing the Provincial ties and showing their colours with pride and encouraging people to join the Craft have seen our numbers grow. He said that it was great to see so many people wearing their steward’s jewel and urged those who have not pledged to do so as it only costs a small amount and our Province receives so much in return. Concluding, David said that it was a delight to see so many wearing their Royal Arch jewels adding that it is a colourful and enthralling degree and a completion of Craft Masonry and urged those who are not in the Royal Arch to contact their representative and join. The master’s song was rendered by John Darrell accompanied by Stephen Lloyd. A raffle raised a whopping £380 and to end the evening the newly installed master called on his tyler, Tom Egan for the final toast of the evening. Pictured are: David Winder and Barrie Whiteside (centre) with distinguished grand and acting Provincial grand officers.